it was -21 this morning as i waited for the bus that would take me to the subway station to get to work. the bus was delayed and i had to get inside the bus shelter. i was pissed that i couldn't see if the bus was coming because the entire plexiglass enclose was covered in frost both inside and outside. as soon as i realized that it was a rather pretty sight to look at, it was also a good thing that i came to my senses three minutes before the bus arrived, that i took my camera out of my bag so i could take a photo of this. the background was a large evergreen. tagging this for the third week of the 52-week challenge. the inspiration segment is to take an amazing black and white photo of any subject we want. while this may not appear amazing to you, it is amazing to me that despite my knee joints complaining about the cold, witnessing mother nature's work to me is amazing. and to be enclosed in a bus shelter (after i told a young girl who was chatting on her phone so loud it hurt my ears, to tone it down -- she just went outside and paced on the snow-covered grass) filled entirely with frost, that's rather awesome, don't you think so? okay, so you don't, but i do. @northy - i think it was, but there was no wind so it wasn't so bad. and we went down to -16 after lunch. yesterday morning it was -22 with a fierce wind that's why it felt much colder. i'm in hamilton this weekend to assist a friend organizing a book launch, are you free next weekend (start of february) to go to that museum? It's absolutely amazing for me. My goodness, -21 is brutal, but it's disguised in such a graceful way! I really like the pattern. Great capture of the individual 'flakes' as well as the overall pattern. Beautiful creation of mother nature. It looks as if the crystals are strung together. Glad you thought to get it memorialized! Triumph over tragedy! Nicely spotted! Wow Jack Frost was very busy, just for you and your camera!! Beautiful ice crystals. I'm glad you thought of your camera. cannot begin to comprehend going out in those temperatures - we have icy winds and cold humidity but never minus! 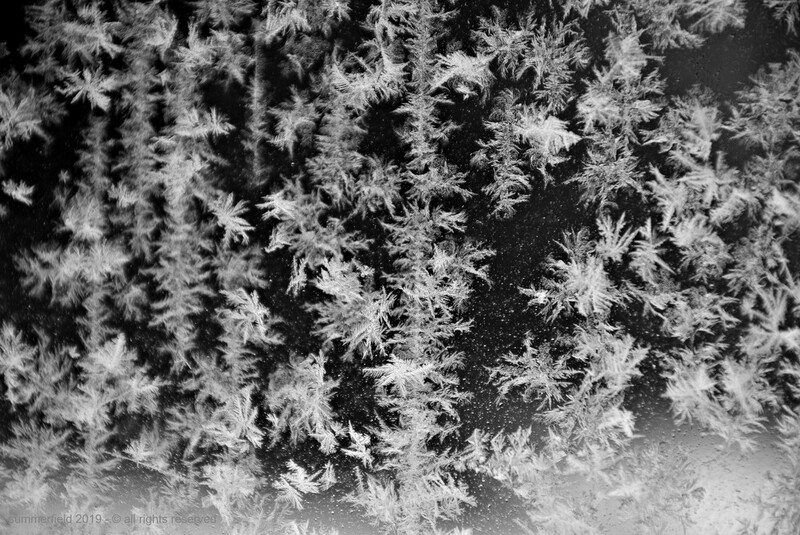 love this and all your lower case letters...lol really looks like a starry night in the back ground of the frosty flakes .... man that's COLD !!!!! Absolutely gorgeous. So glad you thought of it before it was too late because I know you would’ve kicked yourself all the way to work if you have not taken this beautiful image. This is so beautiful and a FAVorite! It is definitely awesome and amazing, in every respect. Well done for coming to your senses and finding the magic in the situation. I can't work out why some people want to share their phone conversations with everyone else around them. Full marks for chastising the selfish young woman. I think it's amazing!! I did manage to capture some frost last year when we were there and I was also thrilled. I also remember waiting for a train on a day almost as cold as that! It's so hard to stay outside and wait but so lovely and warm waiting inside. Good on you for telling off the young girl, haha. Love it! !